The rising increase of Clubfoot congenital deformity medically known as Congenital Talipes Equivarous in children inspired a Non-Governmental Organization, Sure Steps Africa to embark on a 5 km walk in Kaduna yesterday, aimed at creating public awareness on the ailment that can be treated if detected early. Speaking to newsmen prior the exercise in Kaduna on Wednesday, the Founder/President, Sure Steps Africa, Mrs. Omowumi Olukayode Ajulo said clubfoot is treatable using the Ponseti method. The clubfoot walk also aimed at creating awareness and treatment of the ailment by breaking down tradition and cultural barriers, myths and financial constraints of parents to embrace medical services. According to her, “as an affected parent, this gave birth to the Foundation to extend support to children that are affected by clubfoot. “Our services to an extent is free because we’re advocating an early treatment where a child born with clubfoot receives treatment. “Once there is early action within the first week of life Sure Steps Africa takes absolute responsibility for the treatment. 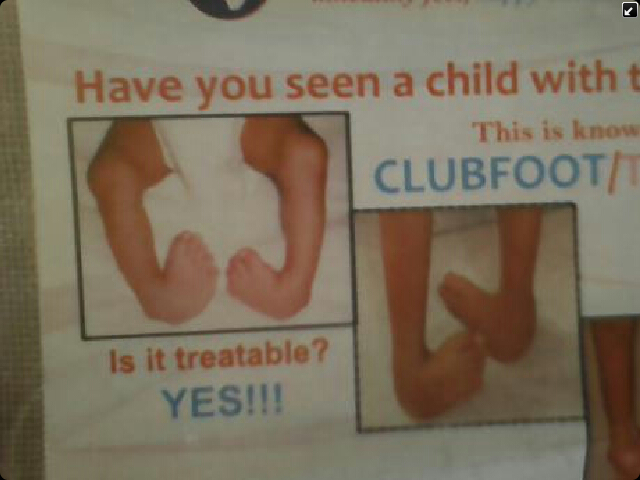 The cause of clubfoot is unknown. It is a congenital abnormality. The deformity occurs while the child is developing in the womb and the child is born with it. “We’re telling people, once you have a child with this deformity, present such a child early within one week of life so that the child attests full correction before he starts walking,” Mrs. Ajulo said. The 5 km walk kick-off from Constitution Rd, through Independence Way and terminated at Barau Dikko Specialist Hospital, Yakubu Gowon Way. At the Barau Dikko Specialist Hospital, Sure Steps Africa visited Clubfoot clinic and Paediatric Unit to address patients with the HoD Paediatric Unit, Dr. Zubairu and Dr. Yusuf Nuhu of the Orthopaedic Consultant in attendance. Dignitaries at the occasion are representative of the Permanent Secretary, Ministry of Information Kaduna state, Mrs. Justin. Barr. Ranti Dauda, President SPRSD; Mrs. Rose Sodeyo and Dan Hausawa amongst others.